Why are They Called Smartphones? You probably hear the term smartphone tossed around a lot. But if you've ever wondered exactly what a smartphone is, well, you're not alone. How is a smartphone different than a cell phone, and what makes it so smart? But to really understand what a smartphone is (and is not), and whether you should own one, we'll start with a history lesson. In the beginning, there were cell phones and personal digital assistants (or PDAs). Cell phones were used for making calls -- and not much else — while PDAs, like the Palm Pilot, were used as personal, portable organizers. A PDA could store your contact info and to-do lists and could sync with your computer. Eventually, PDAs gained wireless connectivity and were able to send and receive email. Cell phones, meanwhile, also gained messaging capabilities. PDAs then added cellular phone features, while cell phones added more PDA-like (and even computer-like) features. The result was the smartphone. In general, a smartphone will be based on an operating system that allows it to run applications. Apple's iPhone runs the iOS, and BlackBerry smartphones run the BlackBerry OS. Other devices run Google's Android OS, HP's WebOS, and Microsoft's Windows Phone. 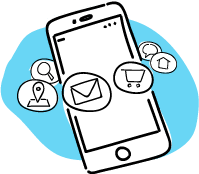 While almost all cell phones include some sort of software (even the most basic models these days include an address book or some sort of contact manager, for example), a smartphone will have the ability to do more. It may allow you to create and edit Microsoft Office documents -- or at least view the files. It will usually allow you to download apps, such as personal and business finance managers, handy personal assistants, or almost anything. It will probably allow you to take and edit photos, get driving directions via GPS, and create a playlist of digital tunes. More smartphones can access the web at higher speeds, thanks to the growth of 4G and 3G data networks, as well as the addition of Wi-Fi support to many handsets. While not all smartphones offer high-speed web access, they all offer some sort of access. Long story short, you can use your smartphone to browse your favorite websites. By our definition, a smartphone includes a QWERTY keyboard. This means that the keys are laid out in the same manner as they would be on your computer keyboard — not in alphabetical order on top of a numeric keypad, where you have to tap the number 1 to enter an A, B, or C. The keyboard can be hardware (physical keys that you type on) or software (on a touchscreen, like you'll find on the iPhone). All cell phones can send and receive text messages, but what sets a smartphone apart is its handling of email. A smartphone can sync with your personal and, most likely, your professional email account. Most smartphones can support multiple email accounts. Others include access to the popular instant messaging apps. These are just some of the features that make a smartphone smart. The technology surrounding smartphones and cell phones is constantly changing, though. What constitutes a smartphone today may change by next week, next month, or next year. Stay tuned! What Are the Best Cell Phones and Smartphones of 2019? How Does a PDA Stack up Against a Smartphone? Should You Ditch The Landline And Only Use A Smartphone?